68-70 CHARGER EXHAUST TIPS 2.25"
68-70 CHARGER EXHAUST TIPS 2.5"
Stainless Steel Exhaust Tips for 1968-70 Dodge Charger, 2-1/2" Diameter. Sold as a Pair. 68-70 CHARGER EXHAUST TIPS 3.0"
68-70 GTX, ROAD RUNNER EXHAUST TIPS 2.25"
68-70 GTX, ROAD RUNNER EXHAUST TIPS 2.5"
Stainless Steel Exhaust Tips for 1968-70 GTX & Road Runner, 2-1/2" Diameter. Sold as a Pair. 68-70 GTX, ROAD RUNNER EXHAUST TIPS 3.0"
68-70 R/T, SUPER BEE EXHAUST TIPS 2.25"
1968-70 R/T & Super Bee 2.25” Diameter Stainless Steel Exhaust Tips. Sold as a Pair. 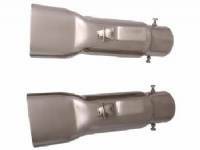 68-70 R/T, SUPER BEE EXHAUST TIPS 2.5"
STAINLESS STEEL EXHAUST TIPS FOR A 68-70 R/T AND SUPER BEE, 2.5" DIAMETER. TIPS ARE SOLD AS PAIRS. 68-70 R/T, SUPER BEE EXHAUST TIPS 3.0"
1971 - 1972 B-Body Red-Slotted Hemi Exhaust Tips. 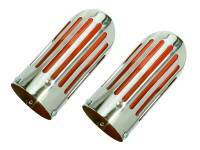 1971-72 B-Body Stainless Steel Red-Slotted (Long Style) Exhaust Tips, 2-1/2" Diameter. Sold as a Pair. 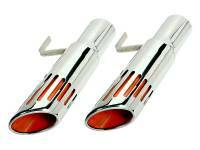 1971-74 B-Body Stainless Steel Red-Slotted (Short Style) Exhaust Tips, 2-1/2" Diameter. Sold as a Pair. 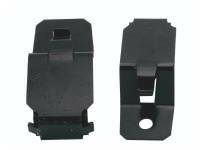 1968-70 Charger Zinc Coated Exhaust Tip Hangers. Sold as a Pair. 1971-74 B-Body Zinc Coated Exhaust Tip Hangers. Sold as a Pair. 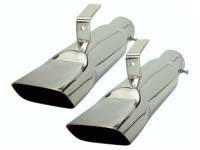 1968-70 B-Body Stainless Steel Exhaust Tip Hangers. Sold as a Pair.